The most amazing things that have happened to me in my life all occurred the very moment I stepped out of my way, and relaxed into this eternal moment of now. When the mind is set aside, you’ll notice there is this sense of great trust in the entire Universe. You feel that everything truly is perfect exactly as it is. From this place you can relax deeply enough to access the innermost core of your being. This is where you will experience yourself as divine, and can know your connection with an all-powerful intelligent energy that is already helping you manifest everything your soul needs on your path to enlightenment. The innermost core of your being is extremely magical. It defies the laws of what the world believes is possible and not possible. To arrive there you must simplify your mind, hold strong your intention, and be receptive to the experience of "pure being". You must have tremendous courage and surrender yourself fully to have any experience of it. Approach it as if you were watching your last sunset on Earth, so take an infinite dive with your whole being into it! The magical core of your being is by far the most sacred and profound experience you can have in this Universe! Why is this? It’s because you are finding the original Source of who you truly are. This is what gives your life meaning, purpose, direction and joy! It also allows you to manifest anything your heart desires. The magical core is what breathes life into you, gives birth to every thought, feeling and is the source of all freedom from suffering. It is what happens to you when the continuous mind-chatter has taken a vacation and fallen far away. It’s very important to be gentle with yourself on this inner adventure, for you were unknowingly conditioned and programmed by parents, siblings, school teachers, the T.V. and media to believe you were a limited being who had zero natural manifesting abilities. They may have been very negative and didn’t know anything different! They were unaware of their natural manifesting ability and uneducated on the steps to increase their manifesting vibration! Every human being becomes lost at some point on their journey towards self-realization. It is a crucial part and essential aspect of each soul’s discovery of enlightenment. We must first unconsciously buy into the illusions of the mind, before the consciousness can fully wake up and realize the vast unlimited Source of what and who we truly are. The butterfly needs to struggle to get out of the cocoon, to strengthen its new wings enough to fly! The good news is that you are not totally lost, nor have you completely forgotten how to live from this greater knowing, wisdom and power. You already are a magical manifesting being, you simply are in the process of remembering how to access this power inside you again. The first step is acknowledging and honoring this great magical God Source of infinite wisdom and power is always emanating from within you, at the very innermost core of your being. When you stop trying to find it and just relax into the pure presence that is the core of "you", you’ll see it was always there. As a child you felt this divine connection most of the time. Coming just out of the womb you were unaware of any feelings of disconnection. Now, with all sorts of life experiences to tell you otherwise, you simply get to return to that childlike innocence again and recover your connection! The more often you can remember to stop the mind, relax your body and rest into your innermost core, the more this all powerful magical truth will reveal itself to you. Below is my 90 day online program I created which has 8 sacred habits which will permanently help your body and mind consistently remember the all-powerful magical being you truly are…enjoy! Want to FEEL Instantly Inspired? 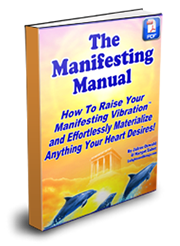 Instantly Download the Super Manifesting Package and start taking control of your destiny today! 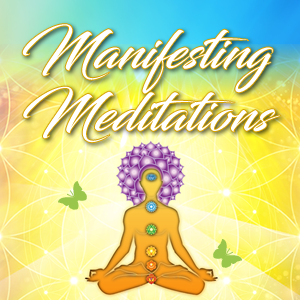 You’ll receive all 12 Manifesting Meditations on MP3 download, 6 Enlightening Bonus Materials, our 250+ page Manifesting Manual, and 3 Enlightening E-books that will transform the next 3 months of your life completely! Get ready to take the essential steps to start manifesting your dream life THIS WEEK!! Click Here to See What’s Inside the Super Manifesting Program! begins to vibrate as if I just plugged into the Universe!" ~Morgan, Boston, MA. say in Spanish, "ANIMO!" Lots of love and every blessing to you both." ~Diane Abbott, Spain. Awakening the world one mind at a time! Learn How YOU Can Help Enlighten the Planet and Get Paid For It!